Man Utd player bamboozled at charity event. 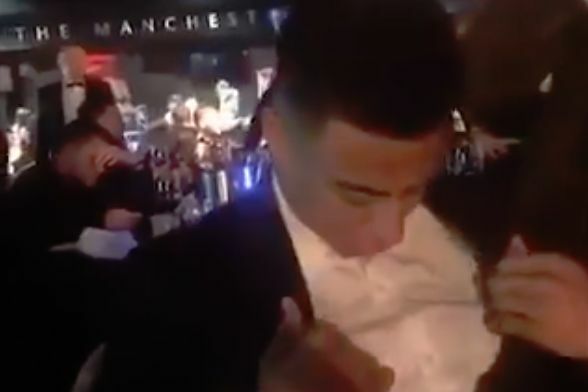 Manchester United’s Jesse Lingard was left baffled by a magician who managed to steal his tie at the United for Unicef gala dinner, without the player realising. Ole Gunnar Solskjær’s squad attended the annual event with their partners on Tuesday night, reportedly raising £225,000 for the children’s charity. Hosted by Man Utd fan Angus Deayton in the partnership’s 20th year, there were fundraising games and a live auction as well as roaming entertainers. In this clip, uploaded to Instagram by teammate Romelu Lukaku, Lingard appears bemused as a rope unties from around his neck as part of the trick. While in a state of confusion, the England international has his tie snatched off his shirt. The others at the table are asked not to give the game away while he slowly realises that something is amiss. Why is he wearing a clip on tie?